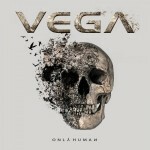 Share the post "Album review: VEGA – Only Human"
British melodic rock standard bearers Vega are not ones to let the grass grow under their feet, this being their fifth album since 2010. Its predecessor ‘Who We Are’ was their most consistently convincing yet and indeed was voted GRTR! writers’ album of 2016, so the bar has been set very high for the latest release. Although the verse is not the most convincing with a strange distortion on Nick Workman’s vocals, lead off track ‘Lets Have Fun Tonight’ has a huge chorus which, with its ‘be the life, be the soul’ refrain I can visualise as the opening track in a live set already stuffed with anthems. From the outset Vega always had a modern approach avoiding traditional visual and musical clichés, but with every album they edge closer to the mainstream. In particular the fast fingered Marcus Thurston is given more scope to shine on album than before with his solos notably on ‘Worth Dying For’, the lyrics a trademark positive call to arms, and ‘Mess You Made’. Introduced by a spoof US radio announcement, ‘Last Man Standing’ has a distinct Bon Jovi feel, with Nick’s vocal inflexions, the song structure and even in the song title. Other songs are typical Vega with all the hallmarks of the Martin Brothers hook-filled writing style, ‘All Over Now’ up tempo in feel and with prominent keyboards, while the typically anthemic title track has a U2 esque feel to it with Jon Bon Jovi-style whispered vocals on the pre-chorus bridge. They strike the difficult balance between sticking to what they do best and progressing with some new sounds, such as on ‘Come Back Again’ which has a slower tempo with almost military drumming and prominent synths. There is a brief but slight dip in quality in the middle with ‘Gravity’ and the piano-led ‘Standing Still’, the latter having perhaps too much of a modern pop vibe for my taste. ‘Turning Pages’ has a slow, dreamy feel in tune with its evocative lyrical message but the album ends on a more up tempo note: ‘Fade Away’ could be a missing track off Bryan Adams’ Waking Up the Neighbours’ and ‘Go to War’ has another huge, anthemic hook. This entry was posted in ALBUM REVIEWS, ALBUM REVIEWS (Mobile), All Posts and tagged album, Marcus Thurston, melodic rock, Nick Workman, Only Human, Vega. Bookmark the permalink.